Made in China from quality ceramic, this traditional sake set features beautiful traditional designs along with plum blossoms and floral vines and petals on a dark off white or dark cream surface. With a smooth and glossy finish, this traditional sake set comes with one jug and four matching cups to share delicious sake with family and friends. The tall sake jug features a large round spout with a small lip and two indented sides that are used to hold and pour sake. The entire jug is an off white or dark cream color while the bottom portion of the sake jug, bordered by a brown rim, features dark blue plum blossom designs and patterns along with a contrasting red and green petals. The sake cups follow the same design except with the dark blue plum blossom and floral pattern designs covering most of the cup with a contrasting brown rim at the very top. A perfect elegant gift, this traditional sake set comes packaged in a paper gift box ready to be gift wrapped or presented for holidays or weddings. 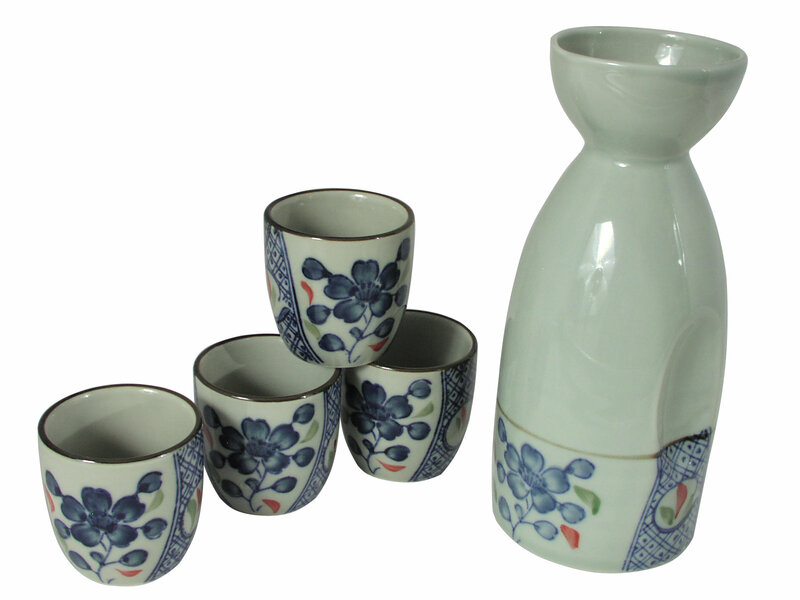 Enjoy chilled or warm sake in this beautiful sake set. Hand washing is recommended for this item.